When it comes to the best paint colours, you’ll be hard-pressed to find brands better than Sherwin Williams and Benjamin Moore. Their ability to tap into both the trendy end of things as well as the traditional means that they are my ‘go-to brands’ when I’m doing my online colour consulting. And as for trends, there’s no other colour blend that is more popular than green/blue. Call it turquoise, teal, robins egg, call it whatever the heck you want – I call it awesome. If you aren’t sure which type of blue you like, check out this blog post re: How to Choose the Best Blue for You! Enough of that now, let’s get onto the good stuff! Sea Salt is definitely in the Top 3 when it comes to green paint colours. Now Sea Salt is actually a green-gray blend, HOWEVER, it has been known to pick up a slight hint of blue, which is why I wanted to include it as one of my FAVES! The green and gray mix together to provide a colourful, but calm blend that is perfect for a relaxing spa-style bathroom or family-friendly space! The LRV of Sea Salt is 64, so while it is a light colour, it doesn’t reflect as much light into the room as you’d think. If you don’t like blue, this is a risky colour. If you don’t like green, this is ALSO a risky colour! I LOOOVE Silver Marlin. It’s flexible, simple and soft look is perfect for MANY styles. This is a more subtle colour with its gray base and subtle stormy blue/green undertones. Silver Marlin has an LRV of 57 so it’s a light/medium tone. If you like a nod toward colour, without a 100% commitment, this could work well for you! Gray Cashmere is a mix of green, blue and gray with a bit more gray than not. It certainly won’t ‘look gray‘ – it will just look like a very subtle, soft mix of blue, green and gray – leaning more to the blue-gray than the green-gray. Gray Cashmere has an LRV of 65 – the highest on this page! Oooo, she’s a pretty gal. Mount Saint Anne is gorgeous blue with a decent gray backdrop and a touch of green to soften ‘er up. Mount Saint Anne has and LRV of 42, so she’s solidly in the medium tones. Rainwashed is a blue, green, gray tends to lean MORE blue than green. The LRV of Rainwashed is 60. CLICK on the above image to see available packages! Hot DAMN, I love this colour! Gibraltar Cliffs is a gorgeous choice for a soft, slightly West Coast vibe! It’s a soft blend of blue and gray with a minor green coming through to soften it up. Notice in the above photos how the colour can rise up or fall back, depending on the light it’s getting. Gibraltar Cliffs has an LRV of 30. So, while it is slightly darker, the colour of it rises up SO nicely, especially when hit with a dash of natural light! When my e-design client wanted a beautiful colour to complement her older carpet and brick (as painting the brick wasn’t an option), I knew JUST the one – Quietude. Quietude is a beautiful blue/green with a passive gray backdrop. With an LRV of 48, it’s a reasonable depth for a moderately well-lit room. While Quietude is underneath Rainwashed in the fan deck, you can expect its blue/green blend to be a bit more balanced! Woodlawn Blue and Wedgewood Gray are 2 of the best blue paint colours. SO many of today’s most popular blues have a lot of green in them. Not these 2. These are almost true blues and only have a small amount of green in them. This stops them from looking icy cold and helps them hold up a bit better in a north facing room. Woodlawn is the lighter version of Wedgewood and they both have just the right depth to look gorgeous in almost any room. Woodlawn has an LRV of 61, so it’s light, but not SUPER bright. Wedgewood has an LRV of 50, so it’s closer to the medium end of things. Moody Blue is a lovely rich, medium to medium/dark toned blue/green blend with a subtle gray backbone to calm it down. Comfort Gray is more or less the light-medium version of Sea Salt. And just like Sea Salt, it’s a bit of a ninja, looking more blue-green in some rooms and looking more green-blue in others! Comfort Gray is a beautiful choice for a south-facing room to balance out those warm sunbeams! So there you have it – just a few of the BEST blue/green paint colours! Not sure which is best for you and your home? Check out my Online / E-Design Colour Consultations! Caribbean Teal!! Bold color but so gorgeous. I know, isn’t it a stunner! I get so excited when my clients try it out as it’s soooo lovely! I’m considering painting a couple of the walls in my living room what I would call a peacock sort of blue so this post is timely for me. That Caribbean blue might work. Wonderful, I’m glad these colour ideas could come in handy for you Holly – did you pick a fave yet? These are beautiful colors. I think it is really hard to get blues right. I love the whites with a hint of colour especially since I’m in a small flat. Sea salt looks like my favourite. Me too! Now Sea Salt is definitely not a hint of colour, she’s a bit more powerful than that – but nonetheless, she is lover-ly! I so love Sea Salt! Sadly it turned out light blue in the area I wanted it. Thank goodness I tried the sample out first. Back to the drawing board. These are all really pretty! And yours tips about the light your room gets were really helpful. That variable always seems to mess me up. And I love the extra you threw in at the end—now I’m racking my brain for what/where I can paint it. Thank you! I am somewhat dying inside. We are building a house and paint is going on this week. I picked out all my colors and wished I would have seen this before. Crossing my fingers that everything turns out as I hope! Hi Susan, I’m sorry to hear you found it too gray. And you are right, while it is a blue/green colour (that leans toward the green side) it does have gray in it which can be exposed in rooms with Northern Exposure which already have a cool gray/blue light coming in. The colour might in it might be a bit more apparent in the evening when the sun has gone down. Hi! I’m looking for a color in the intensity or tranquility or silver strand that is clearly favoring light sage green w blue/grey (not yellow!) undertones. Any suggestions? Curious about the color behind the iron bed in your title picture. Hi Jessie! Have you checked out Sherwin Williams Sea Salt – its a hugely popular colour and is a nice blend of blue/green without that murky yellow! It’s darker version Comfort Gray is similar to BM Tranquility with just a weeee smidge more ‘colour’ in it (less gray). BM also has a special line of paints called ‘Colour Stories Collection’ which they don’t have paint chips of. They have a colour called Picnic Basket CSP730 which is very very pretty. The Colour Stories colours are quite magical because they usually contain approx. 8 tints in them, meaning that they can change a lot throughout the day as they are quite varied – worth checking out! Oh yes! Your response is good guidance on a starting place. I have literally repainted a room just after the paint dried because the color wasn’t quite right. (Even after using samples, etc). Thanks for the tips! I love all these colors! Just bought my first house and it NEEDS a paint job! With a North facing living room, I have to be careful! Oh Chantelle, thank you! I do have to be careful that I don’t cross any lines (which is why my Mom is my editor 😉 I’m glad you liked it, come back soon! Thanks to you, Miss Kylie, we have a beautiful new master bedroom and bath. Loved the information you provided and especially your encouragement to use color! And your choice of whites (the hardest color to choose) was perfect. We took your advice on tweaking colors by mixing 2 gals SW Comfort Gray with 1 gal Sea Salt for the bedroom then used straight Sea Salt in the bath. It turned out lovely….prettier than I thought possible. Thank you so much! I own a remodeling company and blue-green paint tones are very popular! Ironically my wife and I just painted our bedroom a color really close Sherwin Williams “Rainwash”. (I don’t remember the exact name). It made the space way more inviting! Great Article. Hi Bryan , thanks for commenting – feel free to send some photos along and if they are good enough I’d be happy to put 1 on my site with a link to your website as it’s a very nice one! I love getting feedback from peers, so thanks for the note! Sorry for the delayed response. I’m sure you understand, when you are a contractor your house is always the one that gets done last. We painted our bedroom a few months ago, but haven’t finished the furnishings yet. But you are welcome to look through our photos. If you want to use them for great articles like this one, no problem. Just shoot an email- so I can read it. We just “remodeled” our website. Let me know what you think! I love your descriptions and explanations – I know it is not especially popular but I am wondering if you have written about lavender and violet? I owe you all the gratitude in the world. I stumbled on your blog while searching Pinterest for the perfect gray for our large space that doesn’t get a ton of sunlight. I THOUGHT I was leaning toward comfort gray, but after reading your explanation, I gave gray owl a try and LOVE it! I get SO many compliments on the color and I always give you 100% credit! The way you explain how the colors work on walls with different light is so incredibly helpful for me. Thank you so much for helping make my home beautiful!!! I’m back on your sight tonight looking for a blue/green/gray for my bathroom, and know you’ve given me a couple of awesome options. Thank you!!! The granite I love is honed Jet Mist (looks like a gray soap stone)for the perimeter counters in my kitchen and a marble ish quartzite like Arabuscato Venato for the island. But I’m not sure what color paint to use for my kitchen since I have honey oak cabinets. Can you give me some suggestions? I love your advice and boat loads of helpful information about the ranges of flexibility within one color. One cannot go into a big box store and get this information. I’m from Omaha, Nebraska and have an apartment with only North-facing rooms. Thank you for all your tips. ! I love the Caribbean teal!!! So tired of gray! I love rich colors with white trim. Changing all my dingy cream trim to white and what a difference it’s made! May buy a sample of that teal. Great post! Hi Kylie. I know it’s 2017 and not sure if you’ll get this but we had to redo walls after a flood in the basement. We have a forest green love seat & couch. I want to paint 1 feature wall that will calm the green of the furniture. I understand that one should choose a shade that compliments the green. I really like California Teal but wondering if there’s something less intense but still a warm blue/green? Hi Marie, I’m sorry to hear about the flood! If you have a look at my Feature Wall package I think we can get that forest green love seat & couch figured out! Hello. Thanks for your all your helpful insights. I would appreciate your opinion about using Sea Salt in a cabin with a pine ceiling. The pine is natural so has a light yellow appearance with faint grains of rust orange/brown. The cabin is in Alaska and gets natural light due to windows. We don’t have power so there isn’t any other light source during the day- but our days are long in the summer (18 hours) so light isn’t an issue. Any suggestions would be greatly appreciated! Hi Erin, it sounds to me like Sea Salt could look beautiful for you! With less natural light the gray might come up a bit more than not, but it’s still got that gorgeous green/blue to hold it up. I just painted my Southwest facing bathroom ” Rainwashed” . I love it and cosider it to have a definite cheerful green tone. In fact, it is actually more green than I had originally envisioned. Beautiful with white cabinets and trim. I am impressed with your blog and familiarity with colors. Perhaps you can help me solve a color mystery? I wanted to paint my house the same color as this house in the below link. (I have a similar style home with shingles and same roof – GAF Pewter Gray) I paid two color consultants who told me it was SW foggy day and SW St. Barts. I can assure you those are not the right colors. I was informed by another credible source that it is BM Philipsburg Gray. That was not the color either. After a last minute color change, I selected SW Juniper Blue for my house color, but unfortunately that is not the color either. At this point, I just want to know what the color is, since I have been studying these pictures for so long. What do you think? Hmmmmm, you’ve intrigued me. Okay, so here’s what I know about paint colours on exteriors. a) they tend to look a good 1/2 tone lighter once they are applied 2 coats on the large scale and b) the undertones tend to come up more on the large scale compared to the smaller sample. So, I can assure you it is not Foggy Day or Philipsburg Gray, both are FAR too blue for that. ST Barts is better, but too colourful. Now I see that Juniper Blue is a stain colour and it strikes me as being a bit too blue. That being said, you ARE looking at an oil dipped stain effect on those shingles and you can see in a few of the photos it comes up lighter/varied a bit. A few of the photos look a bit more green, a few a bit more blue/gray, so it’s about finding a colour that is ‘similar’ knowing you simply won’t get a match without knowing the exact stain brand/dip. So, let’s see…in the photos, the best spot to see the ‘real’ colour is up near the ceiling line, where the natural light doesn’t hit it as much. If the exposure if this home faces a different way from YOUR home and where you’re looking at your tester, this can make a BIG difference. For example, the north facing side of a home may look slightly more grayed out while a south facing might have more ‘colour’ to it. Another challenge is I can BET you that this photo was edited. The floor looks MUCH too bright – this is easily done and most designers/photographers do it to clear photos up and tweak them. Anyway, I usually talk too much. So, I started at Underseas which is like a green with some blue/gray and it felt TOOOO green. So I tweaked things over to SW Moody Blue. Hmmmm, this is feeling good. When I compare this little sample here https://www.pinterest.com/pin/149392912614666061/ to the photo, I feel like they make a pretty good connection. I still think you might need a WINK more gray in it, but I think it’s on the right track. Then there’s Benjamin Moore Stonybrook which has the right green/blue/gray blend, but it might be just a stitch too gray. And if you are going absolutely crazy I’ll leave you with the thought that it COULD be a custom colour. On a small scale you can make a colour custom simply by darkening/lighting it by 25% – 50%. On a large scale, you can do things like ‘add more black/red/blue/white’ to get the tone you want. So, this could EASILY be what they’ve done and would explain why you can’t find it! Ahhhh! I did a bit more snooping in the comments and see that they said ‘colour is a custom order from BM paints’. See, you aren’t losing your mind! I hope that helps and you HAVE to let me know how it goes – hopefully these colours will atleast get you a bit closer! Hi, Kylie. I have to choose pain for my office at work, and can’t try colors. I just have to choose. Ack! It’s a window less office – 8 x12. There’s slatted florrescent lights, and I can’t hang overhead, so I’m thinking about removing outside bulbs and using floor and other lighting options from IKEA. The carpet is dark gray. I haven’t picked out furniture yet, but I’m thinking about white and grays with bold blue/green accents. My favorite colors are deep royal blue and edgy green. I don’t want that on my walls, but thinking about for my accents. Any thought on paint color. I was looking at Sea Salt, Reflection, Tradewind., and Silver Strand. It’s the sight unseen part that’s tough. I’m looking at repainting my living room sea salt. It is east facing with only one large picture window, so not much natural light. Will sea salt work well in an east facing, low light room? Hi Marcie, well Sea Salt can work well anywhere, it just depends on what LOOK you are going for. Sea Salt is well known for going greenish in one room (which it’s foundation suggests it SHOULD) but then in another room it goes blue/gray! With a more shadowed space I would imagine that it might go a bit more green/blue in the morning and then more gray/blue in the afternoon when the sun is opposite. What a helpful post! I found your site while trying to determine whether Rainwashed would look too pastel/beachy/candy for the first floor of our new home, which is a mixture of dark wood floors and ivory carpet. I’m trying to decide between Rainwashed, Copen Blue (which is a bit more blue and instense), and a match to Restoration Hardware’s Silver Sage, which is slightly more grey than Rainwashed. I love Rainwashed on a large test swatch, but for some reason when I do a google image search for it, the rooms mainly look pastel minty rather than the green/grey of my swatch! I’m not sure who to believe, the test swatch or Google image… any advice is appreciated! BM grey wisp cc 670 is a spectacular grey green blue colour. Have it in my mudroom and my laundry room. Cabinets in both rooms are BM balboa mist with oxford white cc 30 on all my trim. I absolutely love this blue gray green as it is fresh and bright but soft and changes depth of tint in different light levels. The “chip” does NOT do it justice, you have to put it on a wall to really appreciate it. I totally agree, Gray Wisp is a stunner! You should send photos!!!!! 1. If the ceiling is flat yes, if the ceiling is textured? no. 3. If it’s a lighter gray, like atleast 65+LRV then yes, if not, then no. Hi Kylie! I’ve enjoyed reading your blog! Lots of really helpful info! What are your thoughts on BM Palladian Blue? I noticed you mentioned it in the section on SW Rainwashed. …I happened upon Palladian Blue years ago and painted my mother’s dining room in it. It goes very well with antique decor. Now I’m thinking about painting my bedroom in it. I’m going for the look you display in the bedroom pictures under BM Woodlawn Blue and Wedgewood Gray – which are colors I’ve thought about too. Hi Kristen! I do like Palladian Blue. It’s an interesting one, but I do find it’s best for south or west facing rooms as sometimes in north or east it can feel a touch too cold…but yes, it’s LOVELY with antiques – well done! I need to paint the exterior of my house . I would like a sagey gray green that doesn’t shift too much to blue or gray and won’t over power my low ranch style home. We have dark brown trim and a dark brown roof with white soffits and fascia. I’ve tried many shades and they all look too blue, gray , are too dark or muddy. Any advice would be appreciated. Thank you. Pam, I’m looking for the same exact color for the same style house! Did you find one that worked for you? I have been trying to find a gray paint that doesn’t turn purple. I have had three Sherwin Williams color consultants come out to my house. They have said my house is difficult because the colors change from one wall to another. I would like a light gray for my main area. (living, dining, kitchen and entry) I am trying to find something that looks good with my counter tops. The first two ladies said my counters had warm grays in it and the third lady said it looked cool. The first consultant came out and we just looked at swatches. The second lady recommended Worldly Gray and it turned out looking purple during the day and mauve at night. The latest lady recommended I try Useful because she says I need more green undertoned grays to help with the purple and blue that seems to come out on my walls. It looks green on the sample chip and I’m concerned it won’t look gray. My hubby has changed out all the light bulbs to natural light that is about 4,000 k and 60 watt equivalent. Is that okay? I have bought at least 25 different shades of gray. Colonnade looks blue/gray in my main living area but tan in my bathroom. I like the softness of Colonnade but I’m concerned it will look purple if I lighten it because Modern Gray looks purple to me. Repose and Agreeable are the only two Sherwin Williams paints that I went to Home Depot and had them make a little sample of. Do they look the same as having Sherwin Williams make them? Repose looks blue as blue can be. I would love for Repose to work because I have painted a bathroom and bedroom with Mindful. If I lighten Mindful will it go blue like Repose? I lightened Knitting Needles to 80% and it went blue. I NEED help. Picking a paint color has passed being fun. I am so stressed and overwhelmed. My painter would like to start on the new color in three days and I don’t know what to do. Hi Christina! sounds like you’re spinning in gray circles. You’ve figured out the hard way that there is no perfect gray. Gray will have undertones of blue, purple or green. These undertones can be enhanced by exposure, interior light, etc…(and those are awfully cold temp bulbs you have in there). One of grays most NATURAL states, looks like a blue or purple undertone. To cut this back, you need to make a warm gray or greige – which can still create purple/green. So, it sounds to me that if you don’t want blue, green or purple, that gray is just a risky endeavour for you given your interior light, countertop, possible exposure. You also have to make sure that you’re sampling the right way, and not just painting samples right on the existing wall colour as this can GREATLY influence your perception of a colour. It needs to be on a poster board with white around it, to give a visual break between the existing colour. 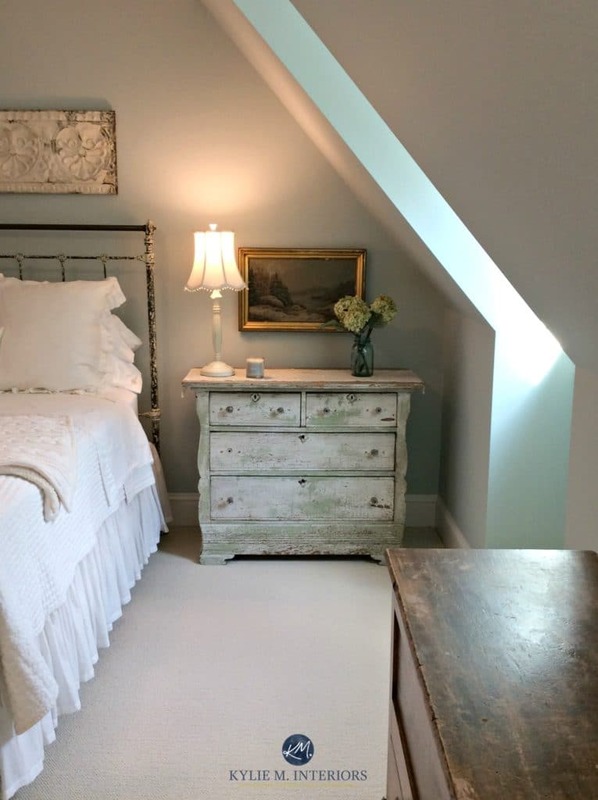 There won’t be a gray that does the same thing in the day and the same thing at nite – unfortunately that’s just not how paint works, so it’s about finding the one that generally works most of the time. This is best shown via Collonade looking lovely in one space and tan in another – this is gray and greige doing its thing! Hi Kylie. Thank you so much for getting back to me. I meant to say that Worldly gets really taupey at night. I guess taupe and purple are the undertones I’m not liking. Do you still recommend the same colors mentioned above? I just want to find a gray color that will look good with my counters ( https://m.lowes.com/pd/Silestone-Alpina-White-Quartz-Kitchen-Countertop-Sample/999921066 ) and my carpet has brown and blue in it but it looks more brown/tan to me. What kind of light bulbs do you recommend? I am thinking of doing your online decorating. What questions do you ask? Will you explain more about this process? Thank you for your wisdom and time. I have a small 3 bedroom house with nicely lit rooms. I had the hallways repainted a few years back in a nice light green which doesnt stand out but definitely helps the house look happier and bigger. Now its time for the master bedroom/bath. I really want to find a good combo of a gray type color for the bedroom and a gray/blue/green type color for the master bath. Could you recommend an awesome duo please? I have been watching you videos and reading your blogs (fantastic by the way!) but the more I do the more colors I like…! Please help! I feel like im spending way too much time on this. I have white trims and i’d like colors that make rooms look well lit and bigger. Have you ever tried Half Moon Crest (Benjamin Moore)? It pictures I’ve seen, it looks like a really pretty gray that leans slightly blue or green, depending on the lighting. Hi Rachel, I haven’t, but you’re right, it’s a soft gray with a blue/green undertone that is MORE likely to lean a bit more green than blue – just a bit! Thanks for the reply! I always enjoy reading your posts. I’ve learned so much about paint colors since I found your blog! 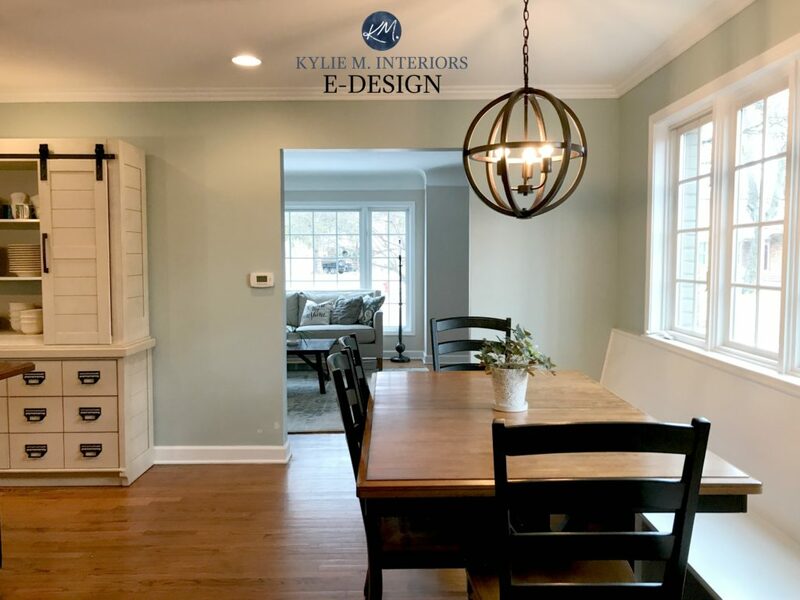 Hi Kylie, we just painted our laundry room sea salt, and the main areas of the house canvas tan and neutral ground…I love it! Next up the master bedroom. It is an open floor plan to the master bath. Since I love sea salt, wondering how comfort grey will look. I read it goes well with dark wood tones, which we have. There is a decent amount of light, south facing. I am not drawn to greys. How do you think it will show in this scenario? Thank you! Hi, what is the difference between SW comfort grey and BM Tranquility? I want a blue green, leaning more toward blue. Thank you. I have a mudroom with a back door to the backyard. The back door is yellow. I wanted to paint the wall with the door Revere Pewter and then paint the other walls in the room a teal or turqoise color. What do you suggest? Do you know which gray is paired with Gibraltar Cliffs in the photo above? The 2 colors look gorgeous together! LISA, I’m seriously JUST about to post a blog post about this colour – focused on our entryway, but you’ll get the gist. In a few weeks I’ll be putting out a colour review on it and the colour IS…SW Collonade Gray! How will Rainwashed look on a north facing house throughout for a 1940”s renovated home? Hi there, love your website! What is the grey color on the walls next to Gibraltar Cliffs? Hi Kylie, I have enjoyed reading your blog and appreciate all the great information regarding paint colors. We have a summer home on the water. The majority of the house is painted Woodlawn Blue which I LOVE. I am considering repainting the master bedroom Wedgewood Gray. This room gets a great deal of natural light and is on the second level. On the first floor, we have a bathroom that I would like to repaint. It has no windows. The cabinets are an off white to cream antiqued color. The granite countertop has some gray in it. I am considering gray cashmere, silver marlin or gray owl. Just wondering what you might think of my paint choices or even recommend something else for the bathroom or bedroom. Hello Kylie, I’m painting my kitchen cabinets in BM Collingwood and wanted to add a touch of grey blue to the island. what color do you suggest. I would like a spark of color, bright, not too dark as I have no windows in the kitchen :/ I appreciate your suggestions. Hi Yvette! It’s hard to toss one off the top of my head without seeing your countertop/flooring/backsplash as there are different types of gray-blue (ones that flash slightly purple and ones that can flash slightly green) and if you choose the wrong one, it would totally clash! Straight up, there is BM Gibraltar Cliffs which leans slightly, but I can’t tell you it will suit your products 🙂 If you’d like to do an Edesign, I have a package for cabinets and can look at photos and suggest ones that make sense! 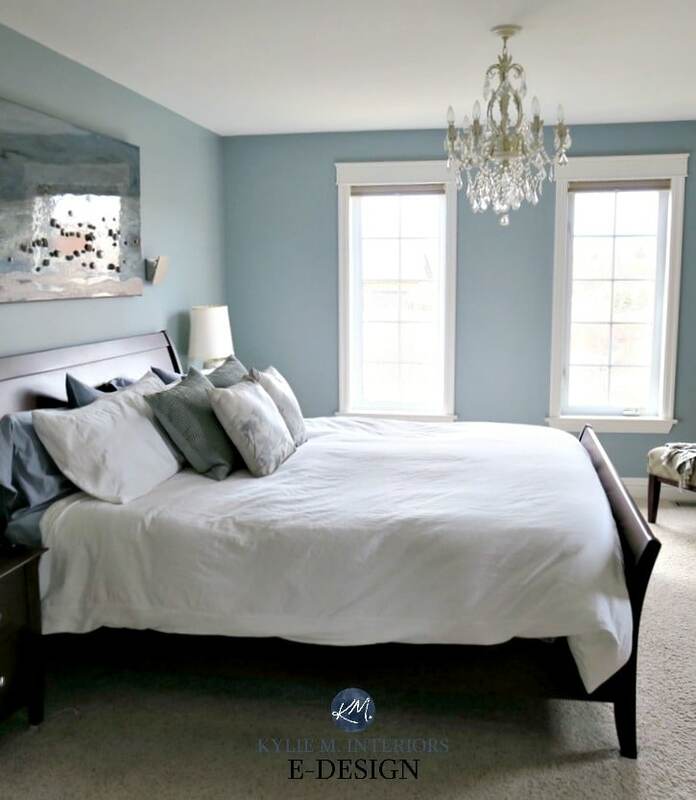 I have SW moody blue on my north facing bedroom and love it however stumped on what color type would go in the adjoining south facing master bathroom….Thinking SWChina doll or lighter color on moody blue strip?